So, the wheels somewhat came off my little writing wagon over the Christmas season, no writing, no blogging, very little reading. I had a great few weeks though, visiting family and friends back in Sydney. Now I’m back in Wellington I am faced with a list of questions rattling around in my head. 1) What are my goals for this year in terms of writing? 2) What are my goals for this year in terms of production management – transforming my writing projects into published works? 3) What can I do to better prepare myself for marketing challenges once I am ready to publish? 2014 will be a busy year with sound work, perhaps my busiest year yet. So it will certainly be a challenge to find time for my writing, but I must make time and I must start taking it seriously as a business. Answering the first point should be relatively straightforward (one would hope!). Writing should be the easy part, but I still need to set myself goals and work towards them…more about that later. Point 2 and 3 however, need a lot more consideration. 2013 was a better year for my blog, simply because I actually posted on it, but I have a long way to go before it is of any significant interest to people. I need to shift my focus. Instead of thinking that I am simply making art for myself I need to concentrate on investing myself into a community of artists and view my work as something that I want to give to others. I need to start to be more serious and studious about networking. The writers who I read and follow on the internet are the ones who are giving back. Since we’re talking about building networks with colleagues, it is the positivity and enthusiasm of a writer that I’m looking for, not their genre, style or background. I might love a writers style, but unless they have an engaging and optimistic outlook then I wont necessarily think of them as a valuable contact or source of inspiration. I am drawn to the bloggers who have some insight, who have taken the time to do interviews and reviews on other people, writers who offer experiences both positive and negative that they have had. The success of a writer’s marketing strategy can be pinpointed to something so simple that it really can be seen as the mark of success in every aspect of life. The strategy is simply – generosity. It is almost unfair to call it a strategy, it is more like a modus operandi. If you are generous, willing to share and open your heart and mind to others, then they will open their hearts and minds to you. It’s not just about buying other writers books and expecting them to buy yours in return, it is about sharing ideas and broadening your online networks by engaging in insightful and honest conversation.As well as getting your name out there by word of mouth. It might just make you a better writer and person too. So that is my writing goal for this year, to find ways to engage more, start up conversations, read other peoples books and blogs and write reviews, even do interviews. To find ways to make the most out of the exchange between colleagues both here in New Zealand and abroad. I am also part of the film community here in Wellington. I sometimes take it for granted the network of people and artists that I know here. Even worse, I completely neglect to interact with them sometimes when they are all right here, living in my neighborhood. So, hopefully I can aim to do better here in my own backyard too. How about you? What are your new year writers resolutions? ‘Beauty is truth, truth beauty’, so said Keats. I wonder what each person sees in their mind what visions are conjured when they hear that phrase. Or perhaps, what they envision when they simply see or hear the word ‘beauty’? The mystery of the mind and its complex machinations is at the heart of all art, no matter how small or great. The child sitting at a desk at school writes what he or she sees of the small world that they know and the great universe they can imagine. The rulers of countries sit at their desk signing their name and attaching it to ideas and dreams they have about the future. Too often people consume their day with negative worries and fears. So much more time should be given to our imaginings. So much more effort should be spent on visualisations of what we hope will be, what we wish to achieve. Especially if those dreams and wishes are of things that are good. I was inspired just now about the concept of beauty when I was flicking through YouTube watching short animation sci-fi films. There is some outstanding work being done out there, especially by people who are funding the projects themselves. Often I get so caught up in reading current sci-fi work that I forget how immediate and blistering inspiration can come from sight and sound. How the vast landscapes of written text can so quickly be etched into mindbogglingly beautiful reality through the medium of film. Short films in particular, need to infuse a ton of of ideas into the viewers imagination in a short window of time. Perhaps this gives the short film genre more license to be more disjointed and incomplete than feature films. They offer only fractured glimpses of another world just as short stories do, without being bogged down by the constraints of character development, story arcs and plotting that larger works depend on. 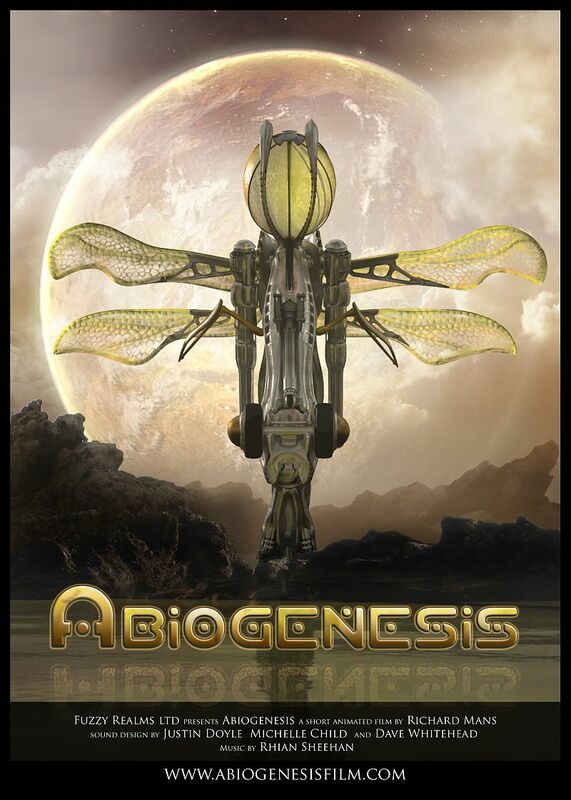 You can buy it here on iTunes: https://itunes.apple.com/us/movie/abiogenesis/id644210102 or preview it. There is only a trailer of it on YouTube that doesn’t feature my sound sadly, nor the actual musical sound track by Rhian Sheehan. It has won numerous festival awards that has put it in a position to be eligible for an Oscar award in 2014. A riddle unsolved, that is the spark of inspiration that I crave constantly. Like a book not quite completed, the painting I imagine myself creating before I start, a quiet afternoon spent pondering what I will do next year. When I was younger I used to think endlessly about the universe and what it meant to say that it was infinite. I used to end up feeling scared, intimidated and helpless. When I thought too long about it all, I always wound up thinking that perhaps there was no meaning to life? Then one day, I had a revelation. A moment of relaxation…of letting go. I realised that if we knew the reasons, the limits, or all the answers then it wouldn’t be nearly as exciting or profound or beautiful. Though every day the sun rises and sets, everything is always changing, always fresh. Transformation of matter and energy is endless and so is my daily appreciation for everything that I see, hear, taste, smell, think and feel. Beauty is just that to me, endless mystery. How about you? What does beauty mean to you? I’d love to hear since only through sharing our stories can new idea be born. Carrying on from my last post about working in film and how it helps me learn about the crafting of story through my experience with the editorial process, I thought I might take a moment to look at the film I worked on last year that has just come out, Elysium. I mean, I’m not going to review it, since I worked on it, that would be a little self-serving. No, really, I just want to talk about how difficult and yet enticing it is to write sci-fi these days. I have always loved science, but I feel that in the last few years so many changes and advances have been made in scientific fields of study that we are really in a very open and exploratory phase of human history. Fields of study that were at one time mocked or ridiculed are now openly accepted as legitimate research subjects or at least worthy of investigating. I feel that a resurgence of interest in sci-fi films and novels somewhat reflects this shift. It’s an exciting time to be writing sci-fi and getting to work on one of this year’s biggest sci-fi films was a real honour. It was also an amazing opportunity to work with writer/director Neil Blomkamp, who is at the forefront of modern sci-fi story telling. I loved working on this project and felt honoured to have been part of a team that was so talented and dedicated. Trying to figure out how a modern teen really would behave in the bizarre circumstances that they find themselves in. All the while I’m conscious that sci-fi readers are among the most critical and scrutinizing of all genre fans. And they have every right to be! I know I’m critical of other sci-fi writers. Is the world building seamless? Is the social/economic/political structures within the world detailed and well balanced to convince the reader that its all real? But unlike fantasty authors, sci-fi writers also have to deal with an audience who have a sophisticated understanding of modern science and technology. Every single reader/viewer has their own opinion on how they foresee humanity will fare in the future – for better or worse. This is the key to understanding the sci-fi genre…because sci-fi stories all have something in common. They deal with the concept of our use of science or technology getting out of hand. The classic Prometheus myth. Sci-fi tackles heavy issues dealing with the human thirst of conquering new horizons without taking heed of the consequences. It is a genre that is about looking to the possibilities of the future in order to take responsibility for the actions of the present. In Blomkamp’s Elysium, for example, we see the dark side of that philosophy. Elysium offers a look at how our current world social and economic structure may lead to a future where social division between the rich and the poor are at extremes and the fate of humanity hangs in the balance. We see a scenario where sacrifices must be made on both sides of the social spectrum, in order for a balance to be re-established. Without going into too much specific back-story about how the world ended up in this situation, Elysium makes the viewer think about the implications of our current world economic situation and do some hard evaluating. The sci-fi author must always be looking to the horizon. I find that it is getting harder to keep up to date with the rapid advances in science. It is really difficult to stay ahead of the curb. You have to identify with modern science and project it forwards, to investigate how it may evolve and change in time and what implications it has for the future of humanity, both good and bad. But if a book takes three years to write/publish then the modern sci-fi writer has to realise that in the time it takes to get the book out there, a whole gamut of scientific discoveries will emerge. Two years ago when I began writing my book, the Higgs Boson particle had not been discovered…NASA’s Curiosity had not landed on Mars…numerous exo-planets hadn’t been discovered including one Earth-sized planet that orbits Alpha Centauri B. And that’s just scratching the surface of what’s been going on. Now, having said all this, my story is heavily steeped in what can only be called magic. I worry about this at times, knowing that hard-core sci-fi readers might reject some of my more ethereal concepts. I try to reassure myself that magic is just as valid in sci-fi as physics, since at some point in our human history, they could be seen as one and the same thing. I tend to think that only by incorporating things that seem utterly like magic to us, can I write sci-fi that is true to what I love about the mystery of science. Or perhaps, I’m just a dreamer who has my head too far up in the clouds? Sometimes I focus too hard on getting the facts right, (especially knowing that my nuclear chemist brother would not approve of my sloppy research). But sometimes, I find it particularly hard to be practical when it comes to some of the core scientific aspects of my work. I prefer to focus on a more philosophical and emotional side of things and sort of let the structural mechanics of the world fall into place around the characters. After all, it’s the character’s story that matters most to me. So, yes, it’s a difficult and yet thrilling era to be working on sci-fi, I might even go so far as to say it’s magical. One of the great things about working on sound for films is the experience I get in learning how to shape and craft a story by examining how film-makers do it. The editorial process for films is similar to editing a novel, in many ways. The first cut we sound editors receive from the picture department, is almost always too long and in need of a major tidy up. Trimming shots and scenes the way we do in writing to cut out unnecessary detail or to speed up the pacing is a big part of the process. Sometimes it is the reverse also true, and a key scene slowly becomes longer as shots are extended to give more time to let poignant moments linger on the screen. Sometimes, the director even has to go back and shoot more footage adding more detail in the cut to explain things that are confusing or just didn’t work the way they had first imagined they would. This is true of the novel editing process, sometimes you have to cut huge chunks of writing out in order to keep the story centered on the protagonist and their goals. Sometimes, you need to add more detail to flesh out an idea that needs more development in order to sell a critical theme or concept. The main difference between film editing and novel editing, (other than the fact that they are completely different mediums), is in my mind, is the fact that from the very beginning, it is a process that involves the thoughts and creative input of not just one person, but many. Dozens or even hundreds of people, depending on how big the project is, put their creative energy into creating a film. Those people might only each have a very small part to play, but they contribute to the overall shape and tone of the film and constantly influence/ inspire or affect the decisions that the director makes as the project evolves. Working in sound, you really notice this, since sound is the last step in the film creation chain. We get to see the picture edit change over and over and over again, refining the story day by day. With each new version, we alter and enhance our sounds that accompany the pictures in a process that can last weeks or even months. Sometimes you have to work very fast to get all the sound blocked out for temp screenings while other times you might be working on one scene that only lasts a few minutes for weeks on end. Although the film started in it’s original form as a script written by a single person or handful of people, once it leaves their hands and enters the machine of the film-making world, it becomes a strange new beast. A conglomerate of creative talents. Sometimes this can be a very fruitful, smooth and rewarding process, but sometimes it can go on and on and become sterile or a confused tangle of competing ideas. At the end of the day it comes down to communication and team work. How this relates back to my understanding of shaping a story is that this endless exposure to other peoples ideas, to the way they see things, affects how I create my sound. The visual effects (VFX) become more sophisticated and detailed, allowing me to think more about the world I’m looking at on screen. I try to make sounds that will immerse the audience in that space. I think about how the sound can affect the viewers emotions. I think about how the sound works with the music to achieve a cohesion between what is really being heard by the characters and what they are feeling. All the while, thinking about the main goal of the film which is – to tell a story. When I’m writing by myself, I still think through the same process. I’m still thinking about the scene as though I can see it. Drawing on all the senses, to describe what pictures I see in my mind. The hardest part is getting that visceral emotion out into words in a way that is as effective as sound. So in a direct way, I’m always thinking about how the words I write, will sound. Devices like onomatopoeia, alliteration and assonance, are all subconscious contributors to affecting how a piece of writing flows and how it draws us in. When I’m cutting sound, no matter how big or small the action on screen is, it could be a car chase or an explosion or simply opening a door, I’m always listening to the shape of the sounds and making sure that there is a flow. Every sound has a beginning a middle and and end, just like every story, every sentence every word. When you break everything down, you see that the process of a story unraveling is just like everything in life, breathing sleeping birth and death, all art is a reflection of this process of beginning middle and end. A three act play. Sound is perhaps the most powerful and primal of our senses. It develops in the womb and is one of our earliest methods through which we can communicate and interact with out world. As a species, sound played an important role in our evolution, helping us to become better survivors in a world full of dangers. Our language sets us apart from other animals. It is through language and written word that we have learned to share our experience and our consciousness with each other. It was the sound and the shape of words and the emotions that they can evoke that I think first drew me to the act of storytelling. I’m fascinated by the nature of how humans tell our stories and how we have done so since the beginning of human history. A love of reading is completely connected to our childhood and our past. The stories that were shared with us from older generations, the histories of our ancestors become part of us when they are told to us. There is such an alluring mystery to the process of hearing about something that happened outside of our own experience. And by hearing an account of someone else’s story we are transported into their minds. It enchants me. I am in love with how the sound of words can evoke a world within our minds, a world that no two people can see the same. This is what I think film is all about. People coming together, to try and take all those individual visions of a story and put them together to form a collective. A meeting point between the vision and imagination of artists working in all different fields. It is as close as technology has so far brought us to sharing a dream amongst others. That is why film is such an amazing force in the world of storytelling, because it’s not about replacing books, its about our desire to share our thoughts and dreams. Outside of people who claim they have telepathy, this is as good as it gets. So I am suffering withdrawal since finishing watching season three of Game of Thrones. There, I admit it. I don’t know what to do with myself, I’m trying to absorb myself with work, but it is just so hard to carry on knowing next season is so far away. It’s so frustrating when a book, or a piece of music, or film, or TV series inspires you so much that you want to somehow incorporate elements of that style into your own work even though they are miles apart in genre or scope. This is how I get into trouble with my story becoming too cluttered and confused. When I think about it, my work on this sci-fi has always been of this ilk. I always set out to make my story like Indiana Jones meets Lord of the Rings, in space, with kids. Or something like that. Yet, I’m aware of how cluttered my book has become due to my intricate genre blending. So now I’m at a cross roads yet again. I had a crisis/epiphany the other day when I realised that I hated the book and it needed serious revitalization. I get a sudden urge to make the book more like that movie I saw, or more like that book I read. I take it as a warning sign that I am not happy with some element of the story. This time, it is my characters. I really need to push them in different directions. This is what I have taken from my watching/reading of “A Game of Thrones.” Despite not being a kids story nor a sci-fi, the character detailing and immersion into the mind of the POV character is something that is universal to storytelling and I’m sure I can do better than what I have already. So what do I do? Do I abandon the story all together? Or do I rework it once again into a new beast? I feat it’s in danger of becoming a Franken-novel. It possesses very few words now that were in the original draft and has somewhat lost its vibrancy because of it. Yet I think it is getting stronger with each re-write and most importantly, I’m learning more about how to write. So regardless of where this book eventually goes, I think that the various lessons I can learn from re-shaping my work will ultimately make anything I write in the future easier and faster so get it to where I want. Inspiration for change is everywhere and you don’t need to lock yourself into reading solely from within the same genre as you are writing. Moreover, it can come from any art from; music, poetry, sculpture. Just a few weeks ago, my partner and I went to the symphony and the whole time I was creating a story idea in my mind, inspired by the orchestra. Sometimes my best ideas come even when I’m doing nothing creative whatsoever, I could be walking down a street or sitting at a cafe, you never know when some idea will strike. So, what do I do when I’m suffering withdrawal from a great TV series? I take what I have learned from the experience. I analyse what is great about the craft of that show and then go to the video store and rent out a new TV series….hmmm…Downton Abby?…sure my kid’s sci-fi could do with a little bit more social commentary laced with witty repartee and a dash of chaste romance. Why not? I recently had a conversation with a friend about artists working at night and the stereotypes of the creative night owl. Many artists slip into the habit of working at nights to avoid the distractions of the day and all of the annoying, loud and demanding people in it. I have discovered over the years, that this is not because I don’t think it’s fun to stay up late, weather it’s for the sake of having a good time, or for work, or just being creative. Nor is it simply because I’m getting older or I find it hard to stay up late. On the contrary I think that there is something magical about staying awake through the hours of darkness. It is an enchanting time, a bewitching time, a time when our decision making is not necessarily at its best, but this can often help us to achieve things we never would in the daylight hours. Some of my best and most inspired creations have happened late at night. But I just cant do it all the time, or I go nuts! I have discovered that when you develop a creative process that flourishes during the day, you can achieve results that are perhaps more consistent, productive and healthy. Being creative during the day is something that you really have to just deal with if you are working on someone else’s project. So when I shifted from being a lazy afternoon working guitar teacher and late night gig performer, to an all day sound editor on films, I really needed to be able to get up early and fly into that creative head space with little prompting other than a hearty coffee (or three). So, even when I am not working on films now, I feel a compulsion to go flat out all day on my own creative projects. I like getting up in the morning and getting stuck into my work, creating and achieving a lot before the day is even half over. Once I have already achieved something in the morning, I feel better about the rest of the day. This goes hand in hand with finding time to exercise. So many colleagues of mine who work in film say that they are too busy to exercise. But I find it is the opposite. I find that taking time to exercise somehow creates more time and makes me more productive. It’s like magic. As soon as I have gone for a run, or done a work out, all of a sudden, my enthusiasm lifts and I feel that I have so much extra time, simply because I don’t waste time by feeling bad about myself. I feel less like eating bad food to comfort myself. I feel proud of my achievements and if I do splash out and eat bad food, I don’t feel as much like I need to punish myself because I have already done something positive with my day. So the earlier I get out there and just do it, the better. Forget about excuses, forget about image, just get your arse out of bed and go make art! So, even though I love my mornings and my days and getting the most out of my creative time, there should always be time for the late night creative burst of inspiration. Or a crazy jam with some creative friends while drinking bunch of fruit cocktails! I found this article, which suggests that people who are night owls tend to be more intelligent, but more susceptible to addiction and generally less reliable, hence the typical muso stereotype. But is it really that simple? Are people who stay up all night working on crazy schemes really smarter or do they just like to think that they are? Other articles I read, suggested that morning people, ‘Larks,’ are often happier, but I know plenty of people who are forced to get up in the morning, and they are anything but happy about it. What do you all think? I’d like to hear your opinions. 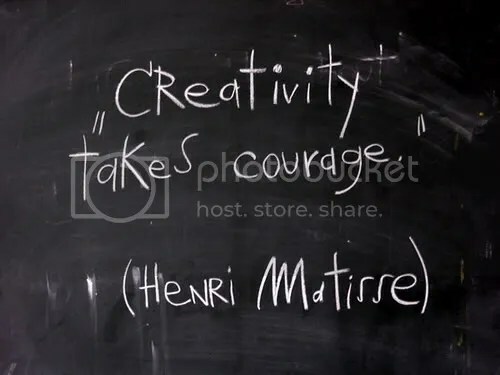 Especially in relation to your creative habits? Which ever way you want to go…I say just be Nike about it. – smash that art and enjoy yourself. It’s been a while since my last post…is this because I have been so busy writing? Now that he has gone home though, I’m left to try and motivate myself to get back to my work. Work for me at the moment is two fold – writing my books and sound design. It pains me to admit that I’m struggling to crack into two separate industries. I have had a few really good sound gigs that have given me some decent credit and I love the work, I love even more that I can earn a living off it. But at the moment I’m busy on a number of short films and it’s hard to find a solid income from it and hard to find mental space to work on my writing. When I’m on a sound job, it absorbs a huge chunk of my creative thinking power and a good chunk of my time. Short films can be incredibly rewarding, especially as the short film director is fulfilling a little dream of his or her own that they have been working on for years and as the sound designer, I get to be there to put the finishing touches on, the icing on the cake. I get to see how excited they are when their brain child is delivered on the mix stage and all the effort is finally paid off. It is a great feeling for them and for me and I always feel so glad to be a part of some art that goes out into the world. I am blessed to have work in this industry. However, more and more I am aware of my desire to finish my book and establish myself as a writer and I feel jealous of the directors that hire me to work on their near complete film. While I’m working on someone else’s project that is coming to fruition I am aware of the fact that I’m not working on my own project. I realize that wanting to be an author has more to do with a desire to fulfill my own creative ideas and projects than it has to do with me preferring writing over sound. As a child I was never sure about what I wanted to be, because I wanted to do so many things. I would write my own little books, draw the pictures and staple them together, I would write little songs on the piano. I loved drawing…I loved writing…I loved music, I loved dancing. I wanted to do ALL art without having to just commit to ONE and I wanted to be free to just create whatever I felt like. So, as much as I love working on sound, at some point I want to see myself putting my creative energy into my projects 100% and I see writing as a good outlet for that. I have to just keep at it and stay positive. Finding a balance between doing work for myself and working for others is an important part of being in an artistic community in any medium and ultimately, every job we have in life adds character and experience to our lives that is invaluable. I don’t want to think of sound as my day job; the thing that gives me money and writing as my pie in the sky dream job. I want everything I do to be done with passion and conviction and all my work must reflect my belief in the power of creativity to realize dreams. Job is a nasty word people use to describe something that should be a manifestation of their life’s energy. I was passionate when I was a guitar teacher, I was passionate when I was a student…I don’t think I could admit to being a passionate shelf stacker, but even that job gave me insight to all the jobs I would rather be doing. Sound design, painting, singing, writing, composing, running, sharing, gardening, cooking, playing, loving. There are so many different ways that I can express how wonderful it is to be a human in this world. Why should my career be any different. Easter weekend was great, but 3 days of eating bad food has left me feeling very slow and clunky. Time to turn it all around! All I can think about is cooking dinner tonight and how great that is going to make me feel. But NO! I can grow my garden anywhere. There are plenty of places around Wellington that are just wasted land where I could set up a guerrilla garden. There are so many hillsides that are just crying to have some food brewing on their lovely sunny slopes. In my book, I am constantly dealing with issues surrounding the destruction of planetary ecosystems through the neglect and selfish ignorance of the species that inhabits it. The truth is, that we aren’t in any danger of destroying our planet, just ourselves. The planet is a big chunk of rock that could be destroyed by some phenomenal cosmic event, but really, it’s pretty safe from us and our lame inability to recycle. What we really have to worry about is abusing our natural resources to the extent that a that we kill off a large portion of the diversity in the natural world and by extension, kill off ourselves. So while this is a hugely important part of the message in my books, so is the actual act of trying to reverse that. Rather than writing a story that simply warns the reader of the dangers of abusing our planet, I want to show the actions of a few, trying to overcome that danger. I have really noticed a change in peoples mindset in the last couple of years. Instead of people merely complaining about the destruction of seas and rainforests and such, people are making a concerted effort to find solutions. This guy, is just one guy doing his bit to bring an idea of sustainability to the people of his community. Interestingly though, social media is now making it easier for people all around the world to feel that the ideas of the few are connected to the actions of the many. It is now more feasible than ever, that a thought I have about being positive and proactive and trying to make a difference can be felt from anywhere else across the globe. Thoughts are really physical and tangible elements of our life that can completely influence the actions of others. It all starts with a seed. So now, I’m going to go chop some veggies for dinner. Since my book is set in space, I spend much of my time thinking up weird creatures that could inhabit other worlds. I spend a lot more time than I should perhaps on this, I think it is just about the funnest part of the process. Maybe one day, I should start to introduce my catalogue of creatures onto the blog.I should do proper illustrations first. I like to think about how the planet my creatures come from could have produced such an organism. How gravity, temperatures, topography, sunlight and chemistry etc, can influence their evolution. One of the best ways to get inspired for creatures though, is often just to take a look at what we have on Earth. There is such a variety of life on our own planet that you don’t have to look far to really find something bizarre. The amount of people posting videos on You Tube of their ordinary cats and dogs doing ridiculous things is a great example of just how alien things that we think of as ‘common’ can sometimes appear. But if you want to go full alien…this is a pretty good place to start. Updated weekly, this tumblr page constantly gives me examples of really kooky animals that have some extreme features of adaptation. Often with some pretty funny captions too. 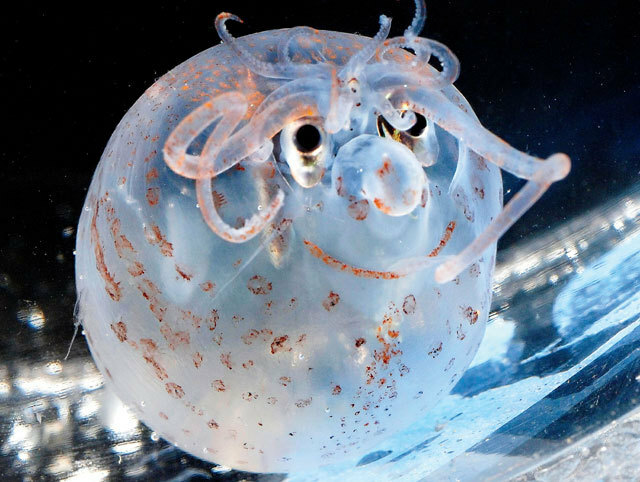 For example, this is the piglet squid. I have never heard of or seen anything quite like this, and if I came up with a creature like this in my book, everyone might think I’m crazy…but see…anything is possible. I just woke up and it is midday. Though, I woke up at 3 am also today and went to Relay for life where I ran around in circles for an hour and thought about all the people I know whose lives have been touched by the horrors of cancer. It was a great morning, i ended up running 20 laps of the circuit, which I worked out was about 11.2Km. Not bad for an hour…but boy am I ruined now! I thought mostly about my beautiful mother who passed away from cancer in 2008 and how much I would love to see her now. She would be so happy that I’m writing as it was always her dream to write books. She was the biggest book worm I ever knew and I wish she was here now to share in my new passion. Thanks Mum, for all your inspiration.